MASKULIŪNAS, Bronius (2018) A Mobile Laboratory: Bringing ICT education to young individuals with special needs. Paper presented at: IFLA WLIC 2018 – Kuala Lumpur, Malaysia – Transform Libraries, Transform Societies in Session 153 - Poster Session. 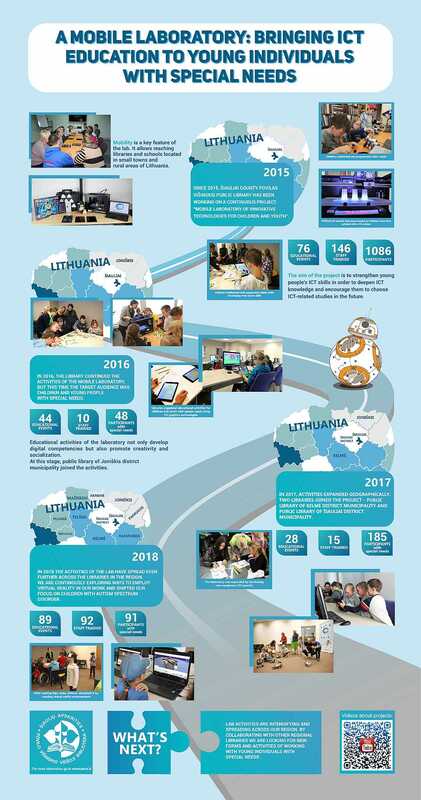 The poster will present a mobile Information and Communication Technology Laboratory (ICT) developed in Šiauliai county Povilas Višinskis Public Library, Lithuania. The innovation and uniqueness of the Lab lies in its mobility and re-usability in small libraries, includes various technological approaches (augmented reality, VR, etc.) to teaching ICT. The Lab aims to reduce digital exclusion of children in regional areas and can be used by those with special needs (i.e. children with autism spectrum disorder). With the poster, we hope to strike interest of libraries to assess their needs for such an initiative and we want to tell our story. It illustrates the idea that a library has long transformed itself into an inclusive and welcoming area for a wide educational spectrum. We hope our experience will be relevant to participating libraries in tackling similar challenges. The poster will present itself with inclusive and attractive graphics referencing an actual laboratory. The viewer will see relevant infographics, pictures and information about the Lab. It will also include a hashtag (#) that when entered into Facebook, Twitter or Instagram will lead to a dedicated page for the Lab.